Today is the 100th anniversary of the Armenian genocide. On this night in 1915, Armenian leaders and professionals were captured and most of them were executed by the Ottoman Turks. In the next few years approximately 75% of Armenians, 1.5 million people, living in the Ottoman Empire were dead. Most Armenians living today descend from the 25% who survived that genocide. Aline Ohanesian’s timely novel Orhan’s Inheritance shares this relatively unknown history through the lives of a survivor and a Turk. Author Chris Bohjalian’s 2012 novel, The Sandcastle Girls, made many readers aware of the genocide which he called “the Slaughter You Know Nothing About.” Ohanesian continues his legacy by taking readers into the history that Turkey still refuses to acknowledge. Ohanesian told Lynn Neary on NPR’s Weekend Edition “There’s only about 6 to 8 inches between an open book and a human being’s heart.” Orhan’s Inheritance bridges those inches with a compelling tale of Orhan Turkuglu who finds that he’s inherited his family business after his grandfather’s death in a small Turkish Village. He also learns that his grandfather has left their family home and its cherished mulberry tree to an 87-year-old Armenian woman who lives in a retirement home in California. Orhan takes his grandfather’s sketchbook to Los Angeles where he meets Seda who slowly shares the painful story of her connection to his family and their lives in 1915. Orhan wants to learn her story yet, he’s fearful as it could mean that his family would lose their home and all they’ve believed. As Orhan sits before Seda he realizes “This woman before him is like an ancient tapestry whose tightly woven threads could tell quite a tale, if only he knew how to unravel them. One loose thread and the whole thing could come tumbling out of her pursed lips.” Seda’s story untangles the carefully constructed history that Orhan grew up believing but in its place comes a realization that acknowledging reality was one purpose of his grandfather’s bequest. The book’s settings: Orhan’s village that seems so unchanged over the years, the Armenian retirement home with its muted colors and expectations, and the 1915 world of the Ottoman Empire infuse the novel with color and a brightness that contrasts with the horrific scenes of war and atrocities. As the novel wends its way between the annihilation of the Armenians and the fears of the Turks today, Orhan learns of family secrets and of a history he never knew existed. Ohanesian recounts the war through the eyes of both Seda and Orhan’s grandfather, Kemal. In a flashback to the war, Kemal tells his fellow soldier Hüsnü, “You know what’s nice? What’s nice is shooting blindly into the dusty unknown, with your comrades flanked on both sides, so no one need take responsibility for ending a life. That’s what’s nice.” Hüsnü is brave and jaded yet later when a fellow soldier dies “Kemal feels as if he’s swallowed a piece of shrapnel. His tears so often shed for paltry birds and strangers, are no longer at the ready. It is Hüsnü who breaks down, hiding his face in his sleeve." Ohanesian’s ability to show both the Turks who were killing and the Armenians who were dying as real people makes this novel palatable and engaging. When the novel returns to the present, it shares the concerns of today’s younger Armenians who beg for recognition alongside women like Seda for whom revisiting the past is so painful. Using art as a metaphor allows both the survivors and the descendants of the perpetrators to understand “betrayals and resurrections." Seda talks of the need for both empathy and action and Ohanesian’s words provide a glimpse into a long forgotten world where readers respect the past and honor those who were lost. Summing it Up: Orhan’s Inheritance is a powerful novel of love, loss, war, and denial. Ohanesian makes unpalatable subjects captivating by sharing the lives of caring, compassionate people who did what needed to be done in untenable times. This is a perfect novel for book discussion groups. Reading Searching for Sunday is a like being the honored guest at a banquet where the finest chefs have prepared your favorite foods. This memoir of a young woman’s journey to discover what church means and whether there’s a place for her in it will make you contemplate your own faith journey. 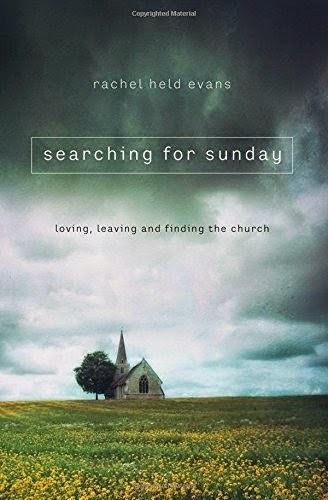 If you’ve never set foot in a church, read Searching for Sunday to learn what it means to be a part of a church community and why it feels like a family – with all the baggage and the joy a family entails. If you love your church, read it to imagine what you can do to bring more people to the banquet. If you’re searching for a meaningful church experience, Evans is telling your story. And if you've given up on the church, there are stories here for you. 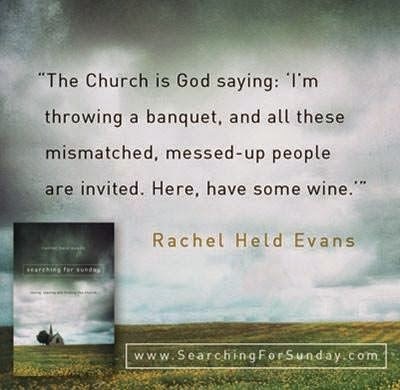 I’m an avid reader of Rachel Held Evans’ blog, I loved hearing her speak, and I’ve read her other books so I expected Searching for Sunday to be special, but it exceeded my expectations because of its honesty, insight, humor, and tenderness. Summing it Up: When Publishers Weekly awards its coveted star and writes “Honest and moving, this memoir is both theologically astute and beautifully written” you can expect a book that will appeal to more than just the usual suspects who purchase religious tomes. Buy this book because it’s beautifully written, funny, wise, and genuine. Get your friends and neighbors to read it too. If you belong to a church, gather a group to read and discuss it together. Note: If I were in charge of the world, our political leaders would be required to read Searching for Sunday to see that their work should be relational. Well-meaning Christian politicians should agree to disagree with each other amicably and this book could help them see a way to do just that. When Joe O’Brien, a 44-year-old Boston cop, starts falling, fidgeting, dropping objects, having muscle spasms, experiencing memory loss, and throwing things during his increasing bouts of temper, his wife Rosie insists that he see a doctor and his diagnosis is devastating. He has Huntington’s disease, a fatal disease with no cure. Far worse than the diagnosis is the knowledge that each of their children has a 50-50 chance of having the disease that could lie dormant in them. The O’Briens live in Charlestown, a Boston Irish Catholic enclave. They own and share a three-story apartment building with their grown children. J.J., a firefighter, and his wife live on the second floor. Daughter Meghan, a dancer with the Boston Ballet, lives with her sister Katie, a yoga instructor, on the top floor and Joe and Rosie share the first floor apartment with their bartender son Patrick. Nothing has ever mattered to Rosie other than her faith and keeping her family close to her in Charlestown. As the practicalities of the disease's ravages begin and Joe and Rosie must face his probable early retirement and the costs of his inevitable care, each of the six family members react differently and it’s their personalities and reactions that make this book so powerful. When one of the children is found to carry the gene, Katie can’t decide whether to take the test. She contemplates whether it’s worse to be positive and face an incurable disease or to be negative while knowing that your beloved sibling is positive. She’s in love and the possibility of the disease hovers over all her decisions about her relationship. Katie is so different from the dreams her parents have for her. Her mindfulness as a yoga instructor has been her core belief, but that was before her father’s diagnosis. Seeing the dynamics of their decisions primarily through the lenses of Katie and her very different parents, makes this book ring true. Surprisingly, this is a joyful book, a novel that makes you think about living that one life you’ve been given to the fullest. Humor, love, and honesty make this book both a page-turner and an upbeat read. As Joe’s illness progresses, and he begins to contemplate the worst, Katie tells him “You’re avoiding a future that hasn’t happened yet.” She and the rest of the family have to learn how not to use the disease as an excuse to limit their lives. Summing it Up: Lisa Genova is a neuroscientist and author who is best known for her novel Still Alice about a woman with Alzheimer’s disease. I didn’t like Still Alice as I found the characters unrealistic and the novel too reliant on emotional appeal so I was pleasantly surprised with Inside the O’Briens. 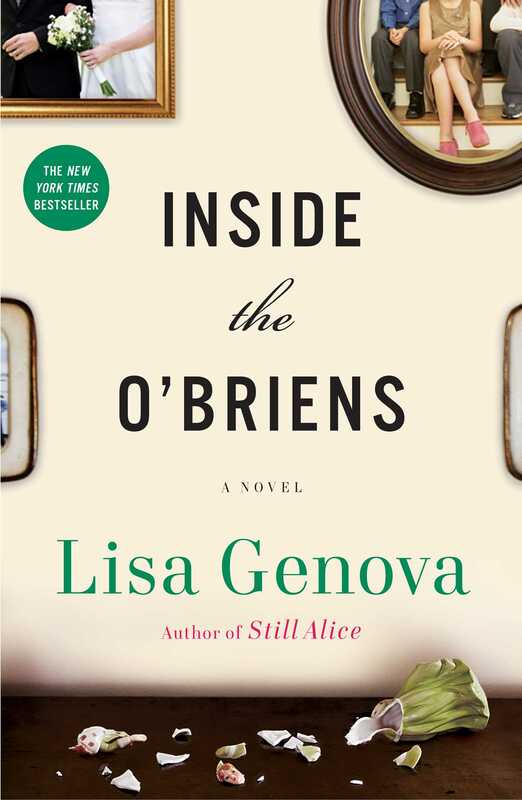 The well-developed, genuine characters, the keen insight into the working of the brain, and an emotional resonance that rings true made Inside the O’Briens a winner. I particularly applaud O’Brien for her development of exceptional minor characters including great medical personnel. Eric, the genetic counselor, is such a compelling character. I want to read a sequel featuring his life and how he handles his vocation. This novel will, as one of Katie’s aphorisms states, make you realize that “Every breath is a risk. Love is why we breathe.” Read this novel for an emotional roller coaster of a ride alongside a family that learns to live life and love each other. My only quibble with the book is with Genova’s heavy hand as a cheerleader in the fight against Huntington’s. It’s hard to argue against Genova’s compassionate search for a cure, but the book suffers slightly because of it.